On a cold icy December morning the choir and friends sang carols in the village, commencing outside Lindsay’s shop and moving onto a warmer setting in Seaforth House, followed by singing in front of the Christmas tree, Main Street and finally moving onto the Cambusavie Unit. The weather may have been wintery but the singing was certainly festive. Smarties Tubes - A big thank you to all those who have been filling the smarties tubes over this year. We have collected £1,000 - a magnificent sum. There are still some smarties tubes on the bookboard for anyone else who would like to join in this form of fundraising. 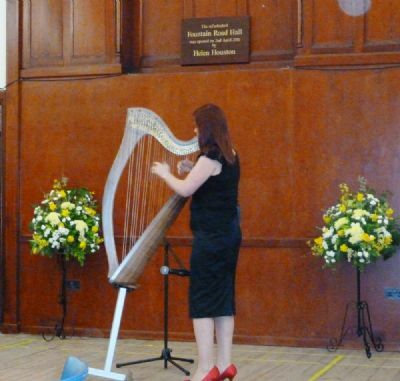 St Andrews Night - 26 November 2011 - An evening of entertainment was held in FRH on Sat 26th Nov at 7pm . We were honoured to have the Rt Rev David Arnott, Moderator of the General Assembly of the Church of Scotland to preach at our Harvest Thanksgiving Service, and we were joined by congregations from Clyne and Helmsdale. The Hall had been decorated with flowers, leaves and berries by various members of the congregation and looked very festive. As part of the Thanksgiving Service the congregation had been asked to bring along items of food which would be distributed by Blythswood as part of their Highland Foodbank Appeal, the response to the appeal from the congregation was excellent. We are very fortunate to have such a generous congregation. Once again the St Andrew's Choir took part in the morning worship and the Call to Worship was the choral piece “O come let us sing to the Lord” to the tune Bon Accord. Following the offering the choir sang "The Lord's my Shepherd" to the tune Orlington. At the end of the service the Rev John Sterrett presented the Rev David Arnott with a card showing the history of Fountain Road Church Hall, three bookmarks with photographs of Fountain Road Church Hall each with a biblical text and a Golspie Mug. The Moderator presented Rev John Sterrett with a beautiful blue and white plate with the wording around the edge “Rt Rev David Arnott 2011 Moderator 2012. In the centre of the plate is the Moderator's Crest which shows the date 2011-2012. A buffet lunch followed to which everyone was invited to join. A day trip was held on Saturday 3 Sept. which included a visit to Hugh Miller's Cottage and gardens, Cromarty Court House and Cromarty East Church. Almost every year a group of cyclists from the Simeon Trust take part in a an "End to End" cycle from Land's End to John o' Groats, "The Race Against Time". They are not racing against the clock to be the fastest to John o' Groats but raising much needed funds for the race against the effects of the Aids Epidemic in Africa especially amongst children. Fountain Road Hall is their last stopping point on their way north and members of the congregation supply puddings for the group. By the time they reach Golspie they have been cycling for 5 or 6 days and are tired. The group this year were in good spirits as usual and eager to finish the challenge. The cyclists really appreciated the prayer as they were leaving and one cyclists said that he had got rather absorbed in this own woes, and this really make him think that his problems would be over by the following week, where as the children they hope to support can suffer for a lifetime so it was very moving. They did all make it to the finishing line safely and a good celebration was had by all, it was a lovely finish as the sun was shining and everyone was very relieved as it had been a really tough 6 days with headwinds most of the way, there was a suggestion that they might do it the other way around next year, but they are rather afraid they would not get further than Golspie and the wonderful puddings supplied by members of the congregation. The riders have raised £14,867.45, which is a staggering amount in the current climate. Lauren Butcher (Isobel's grand-daughter from our newly established Sunday School) completed a sponsored swim in aid of India Village Ministries. She swam 1 mile, which is 64 lengths of the pool, between 13th and 30th June and raised the magnificent sum of £700 for India Village Ministries – well done Lauren. Our church ran a very successful play scheme in July on Monday 4th, 11th, 18th and 25th, and Tuesday 5th, 12th,19th,26th, from 10 a.m.-12:00 p.m and was attended by 10 children. Contact Sandra (01408 633223) for more information. A t the start of the evening Marion Sutherland welcomed everyone to the newly refurbished Hall. 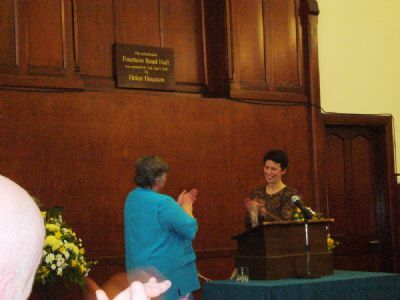 Marion asked Helen Houston to unveil the plaque which Helen graciously did but before that she paid tribute to the hard work of the committee and in particular to Marion. Both Helen and Marion were presented with bouquets of flowers by Sandy Young, the retiring convener of the Fabric Committee and Dr Michael Simpson. The Hall was blessed by the Rev John Sterrett who also prayed for a blessing on all future events which would take place there. Grace was followed by a wonderful finger buffet. For the entertainment part of the evening the new Fabric Convener Tom Macrae was MC. 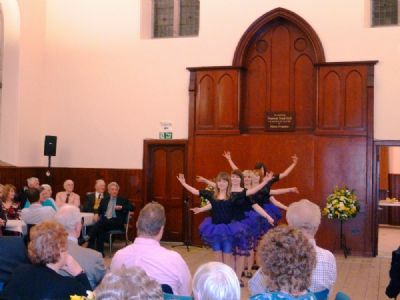 Most of the artistes who provided the entertainment had helped at fundraising events in the hall over the past few years and it was a real pleasure to listen to their music and watch the dancing. There was piping from Jennifer Stewart, songs from Jean Ann Ross and Mhairi Munro, dancing displays choreographed by Kim Mackenzie and performed by local dancers, accordion and fiddle music from Strathfleet Buttons and Bows, and finally there was Jennifer Port who played the clarsach and sang. The haunting music of the clarsach, the skirl of the pipes, the toe-tapping, reels and jigs of the fiddles and accordions and the beautiful voices of the singers will live long in our memories. It was indeed an evening to savour and remember. The evening finished with the votes of thanks from Tom Macrae and the Blessing from the Rev John Sterrett. Some weeks ago several members of St Andrew's Church expressed an interest in forming a choir, not to sing every Sunday but occasionally. And so the St Andrew's Choir was reborn after a lapse of forty or so years under the direction of Bea Mackay. 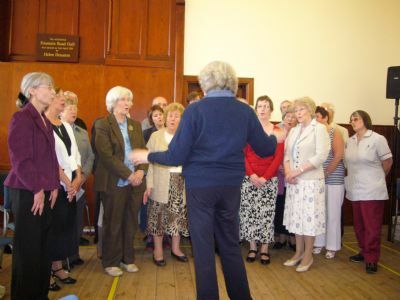 The choir meet on Tuesday evenings and sometimes after church on a Sunday morning. The target was to sing at the morning service on the 1st of May. The anthem chosen was "Lead me Lord" with Janet Pool singing the solo soprano part and the second piece chosen was "The Lord's my Shepherd" to the tune Orlington. So on Sunday 1st May, having been deemed to be almost ready by Bea, the choir sang their two pieces and enjoyed the experience immensely. The singing was also enjoyed by the congregation. 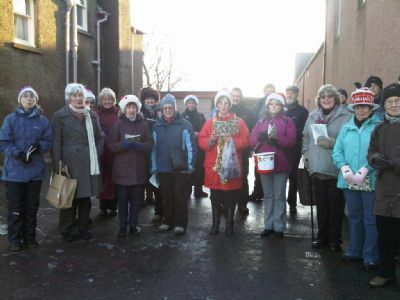 Anyone who wishes to join this group please contact Bea Mackay as it is hoped to continue singing in the near future. The invitation to the marriage of John Argyle and Sally Bradford had on the front of it a quotation from Mark 10:7 "For this reason a man will leave his father and mother and be united to his wife"
India Village Ministries St Andrew's Church hosted an evening with Dr Suresh Vemulapalli of India Village Ministries in Fountain Road Hall on Thursday 24th March at 7.30pm. Dr Vemulapalli is the Headmaster of an IVM school and orphanage in Andhra Pradesh in India and he is ably assisted in his work by his wife Roja. Children who come into the care of India Village Ministries are from the poorest people in this part of India. Many come from unbearable circumstances, abandoned orphans, abused children and some whose family members are unable to look after them. To help break the cycle of poverty IVM is educating Junior College students and some 24 school children from poor families. As well as working with children the group are giving poor and unskilled young women free training in tailoring. This vocational training provides the young women with a skill and the equipment to earn a living in a society without much of a welfare structure. IVM also helps in other areas, with relief work in disasters such as floods, cyclones and fire by providing drinking water from bore wells and constructing hand pumps. In rural India without a husband or provider widows are destitute and often homeless. The Indian Village Ministries helps out with food clothing and medical care. With rampant diseases, difficult living conditions and poor sanitation, medical care in rural India is always a big concern and at the moment IVM have a special project to raise funds for a medical clinic in Puritigadda village to meet the physical and spiritual needs of the people of this area. On Monday 14th June the Golspie Rainbow Guides and their leaders came along to the Biblical Garden to plant up the figures 100 to celebrate the Centenary of Guiding. They used blue lobelia, white lobelia and red begonias along with silver cineraria to create a simple effective design. The area is backed by dwarf hollyhocks. It is good to have young people interested in the garden. Happy Centenary Year to all guides and their leaders.